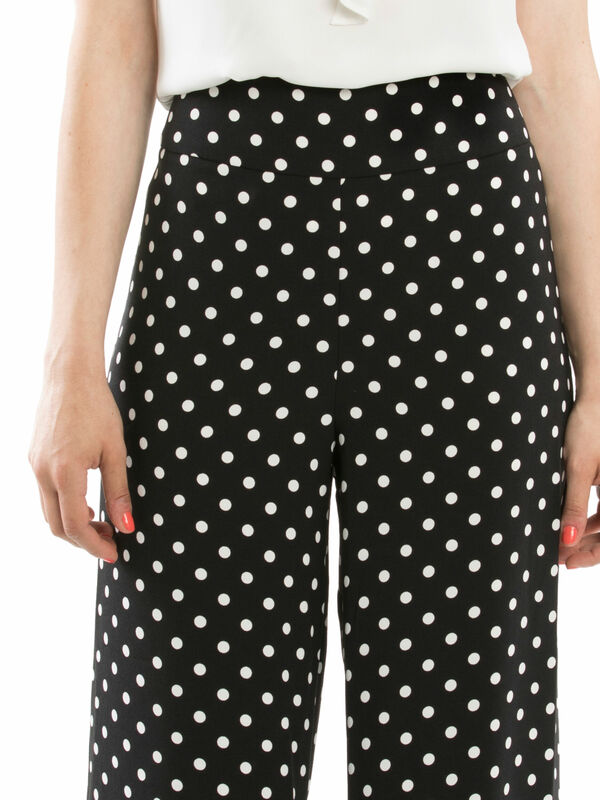 Spot Surprise Pants https://www.review-australia.com/au/spot-surprise-pants/RE19PA014.REBLK019.html Add a spot of stylish fun to the everyday with the chic Spot Surprise Pants. In a sleek crepe fabrication, these full length pants drape elegantly with a wide-leg silhouette. 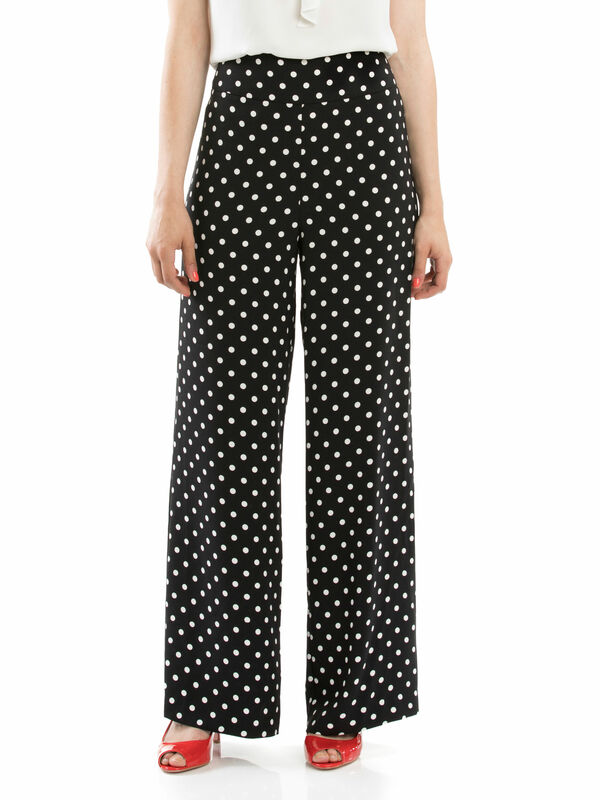 The monochrome polka dot pants have a concealed zip fastening and a high waist. Worn with Monroe Top and Minnie Heels. Add a spot of stylish fun to the everyday with the chic Spot Surprise Pants. In a sleek crepe fabrication, these full length pants drape elegantly with a wide-leg silhouette. 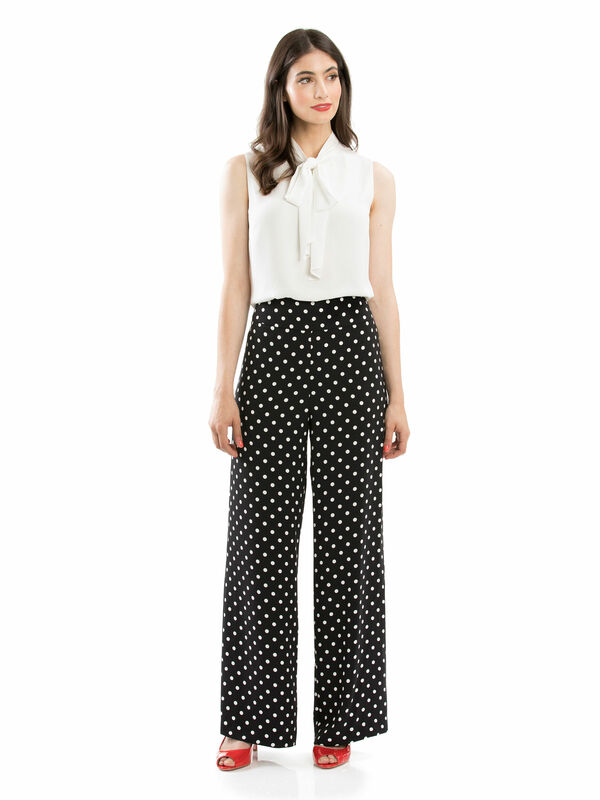 The monochrome polka dot pants have a concealed zip fastening and a high waist. Spot Surprise Pants is rated 4.9 out of 5 by 88. Rated 4 out of 5 by Emskiebear from SO Long! 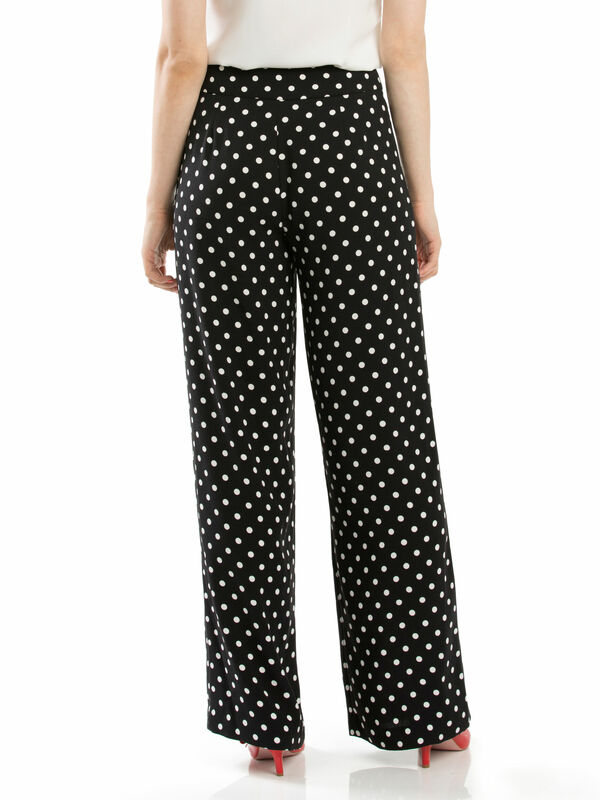 These are beautiful pants, but just a warning to any shorter people considering them - I'm 5'9 and they only sit about an inch off the ground when I have heels on! This is great for me, but shorter people should beware. I'm normally a size 6 in everything at review (I have heaps of pants, skirts, etc.) but these seem slightly looser around the waist than all my other items. This makes them sit slightly lower than I'd ideally like, which also contributes to the length! Overall though, they're stunning and will be so comfortable for work in summer! Rated 5 out of 5 by MariaW from Lovely cut and fit I bought these pants to wear to a cocktail party and I couldn't be happier with them. What I love about them is that you can dress these 'up' or 'down' for a casual look. I have so many different Review tops that go with these as well so didn't have to get a new top. The best thing about Review is that no matter what I but I can always be sure that I will have something in my wardrobe that it will match with even if its a piece from a previous season. Rated 5 out of 5 by Mewy50 from Elegant I bought these 6 weeks ago and have worn them at least once/twice each week. The zip on the side is really flattering because the front doesn't bunch up and everything sits flat. They are quite long so I did get them taken up. I have quite a few colourful Chessie cardigans and they all compliment these pants. My favourite combo would be the Lucky Star Cardi in mint and the vibrant pink from a few years ago. Rated 5 out of 5 by aleccas from Grab these before they’re gone!! These pants are wonderful. They’re so flattering with the high waist, and I love that they’re figure hugging without being tight. They’re not restrictive at all and feel so light and comfortable. I love that they’re perfect for work, lunch or a night out, they can be dressed up or down. Make sure you don’t miss out on grabbing these, scroll up and click ‘add to bag’, you will not be sorry!! Rated 4 out of 5 by Krissy from Stylish and Flattering in a Rust colour now too I already had the black & white spotted pants which after having altered for the too long length are flattering, stylish and comfortable that I purchased the rust and cream spotted pants too. Yet to get these ones altered. I note that this colour is less versatile with top options but can’t wait to wear them. A star off for the extra cost to have shortened if you aren’t extra tall. Rated 5 out of 5 by Fonzie from Small things count First order ever. Open with trepidation. Will the clothes fit me? Are they like the picture? Bam. Lovely note from the team that sent my order out. Beautifully wrapped. And the pants!! Gorgeous! Too long for my little legs, getting them taken up, but they are fab. Best bit actually was the skirt, but I can review that somewhere else. Literally felt like Christmas. Rated 5 out of 5 by KayDee from Simply Gorgeous and Versatile Today I'm wearing my new Spot Surprise Pants and I feel like a million dollars. The fit is superb and I've never had so many compliments. After work I'm going straight into the city for dinner and a show, feeling confident that my classy Spot Surprise Pants will equally be perfect for evening attire. Spot on Review, these pants are Simply Gorgeous!